The decoration of the cross, from a church in Cumbria, combines Christian symbolism with elements of Norse mythology. Cumbria was settled by Scandinavians around the 10th century, and so it is possible the cross’s mixture of carvings is evidence of the Norse settlers’ stories being used to illustrate Christian teachings. The copy was made by Sergeant Bullen, who made a number of plaster casts in both London and India for the Museum. 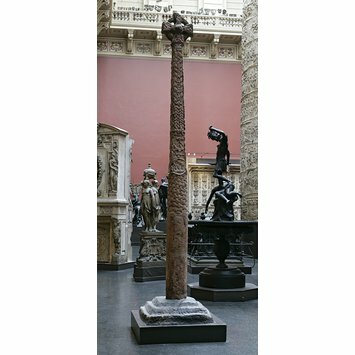 Cast of a pillar cross created in 1882 by Sergeant Bullen for the South Kensington Museum. The cast was created from a red sandstone original, located in St Mary's Church, Gosforth in Cumbria. The carvings on the cross depict a combination of Norse and Christian influences. The cross therefore provides an important insight into the cross-cultural storytelling of Scandinavian settlers in the 10th century. Plaster cast of a pillar cross depicting the Crucifixion and scenes from the Scandinavian legend of Rangnarok. Cast made by Sergeant Bullen in August 1882.